Last year, Jason Licht and other Bucs honchos tried to sell fans a line of false hope and borderline nonsense. It all centered on the fictional and fraudulent notion that signing Super Bowl winners in free agency would somehow rub off on the roster and lead to a championship-caliber locker room. 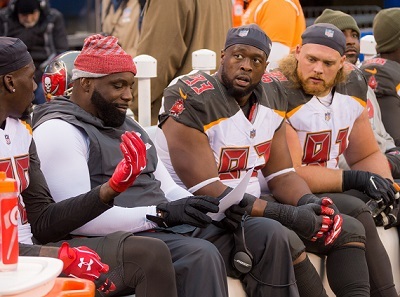 Beau Allen, Vinny Curry, Jason Pierre-Paul and their Super Bowl rings joined the Tampa Bay defensive line and now two of them are highly expendable when it comes to the Bucs roster. Eagles beat writer Eliot Shorr-Parks of WIP radio thinks the ex-Eagles, Allen and Curry, are primed to be cut by the Bucs soon and he thinks they’d be perfect fits to return to Philadelphia. He seems certain Allen represents a chance to right a wrong. Beau Allen, Tampa Bay: The Eagles made a mistake letting Beau Allen go last offseason, and they might get a chance to fix that mistake this offseason. The Buccaneers can save $5 million by releasing Allen, who played in just 36% of the snaps last season. Allen would be a perfect addition to the Eagles, as he knows the defense and could fill in the role he played perfectly in 2017 — the top rotating defensive tackle off the bench. Perhaps more interesting, Shorr-Parks (one of Joe’s favorite beat guys) sees Gerald McCoy as a fix for the Eagles. Gerald McCoy, Tampa Bay: The Buccaneers are expected to switch to some version of a 3-4 defense under new defensive coordinator Todd Bowles, meaning some of their 4-3 personnel will no longer fit. There has been plenty of speculation that McCoy could be a cap casualty in Tampa Bay because of the switch. McCoy had a down season in 2018, as he had over half as many tackles for a loss (6) as he did in 2017 (13). The Buccaneers can save $13 million by releasing McCoy, and if they do, the Eagles could bring him in to replace Timmy Jernigan. Bringing in an established defensive tackle like McCoy would also take off a considerable amount of pressure from whichever young defensive tackle the Eagles draft early on. Man, McCoy landing with the Eagles would be so Bucs. Why? Because Michael Bennett is there and coming off a strong season. As Joe wrote yesterday, this sure smells like the year the Bucs would be wise to blow up their expensive defensive line and get younger and a lot hungrier. “younger & a lot hungrier”??? Isn’t that YOUNGRY? Keep JPP send the rest packing. They were situational players that thrived in the Eagles system and McCoy didn’t have a good season even with JPP playing very well. And you didn’t try to say these were good signings? McCoy would have to take a significant pay cut to fit under the Eagles salary cap. I thought these were decent signings. We overpaid which is almost always the case in FA.. The only thing we can say our bucs do well is how we structure our contracts we can get out of every single FA move with no meaningful cap hits. I think we can upgrade Allen and Curry both depending who is available. Nassib in my mind was playing lights out, I could not believe my eyes. If he does this again next season we must extend to a long deal. Let McCoy go to the Eagles. The most successful head coach in modern NFL history, Bill Belichick, has a philosophy in matters of this nature that has served him quite well. Better to let em go a year to early than a year too late. This is a historically strong draft class for D-linemen, and a pretty darn good free agency offering as well. Also, Vita Vea was coming on very strong to close out last season. And that 13 Million could be far better served investing it else where. Like say, replacing the incumbent 33 year old, injury prone, penalty generating, pass blocking only RT Demar Dotson. Dot’s had a very good run for being an undrafted guy. But his time is up. And it just so happens that there is a very good Tackle available, who has experience playing both tackle positions, by the name Trent Brown. Tag Donovan Smith, Sign Trent brown, sign Mike Iupati, Oline fixed. And it opens us up to draft the best available Dlineman on the board, be it Josh Allen, Quinnen Williams, or a trade down that lands us a couple extra picks and a player like Ed Oliver or Clelin Ferrell. GMC is simpy not the player he once was. Despite being surrounded by the best supporting cast he’s ever had last season, including a Double digit sacker a diamond in the rough beginning to shine in Carl Nassib, McCoy had his worst season to date. The past is the past and the future is now. Cut him, Cut Dotson, Cut Benenoch, Cut Gholston, Cut DJax, and Cut Evan Smith. What was that childish garbage Licht was running around spewing out of his sht box ? I think it was I can’t wait til we go beat people up with our rough tough d line and I believe that childish banter was before JPP . Is it just me or does Licht really look to brag on himself like some type of rookie that has never been there !!! Shut the hell up Jason , you should have signed Hunt for a mil . The only thing beat up and bullied are the fans by YOU !!! Clown Arssss!!! Agree with Bucnjim! Keep JPP, cut the rest. Maybe restructure McCoy but Curry, Allen, and Gholston have to go. I believe this will absolutely take place. There may even be multiple trades for QBs ahead of the Bucs. The Jets are the only team ahead of us that would consider drafting Williams and they need players (which over $100 million in FA will help). Raiders would love Josh Allen to replace Khalil Mack but ultimately will either go Edge or maybe QB (Gruden). Trading back will also be an option. In that case, which I prefer, we snag Christian Wilkins, DT Clemson or Cody Ford, OL Oklahoma. We need to draft dominant BEASTS and football FREAKS!! Kyler Murray may go #1 overall as well which would also contribute to my previous post. zzbuc, I really think it’s possible now. I doubted it as well up until I typed it lol! ncbucsfan …..if that happens, beers are on me…..Hope you are right my men!!! Bucnjim, so you want us to cut Carl Nassib too? And Vea??? That would be completely stupid. I love JPP. I wanted him when he became a free agent. But he’s not exactly getting younger. And, believe it or not, he and Nassib got their sacks because of the strong interior line. If you disrupt that, you have to rebuild it too. Get rid of McCoy and teams will be free to focus on JPP, and his production will plummet. So if McCoy is gone, he’d better be replaced. Personally doubt we’ll go to a 3-4 because a hybrid is much more likely. BUT … IF we did go to a 3-4, we’d still NEED 3 DTs (strange thing about the NFL, injuries happen & fast-paced situations on the field means key rotational players are critical). DLinemen like Beau Allen play a key role on championship TEAMS. Would love to see us end up with Bama’s Quinnen Williams, he’s a BEAST. BUT there are a couple of concerns. For one, we’d have to cut ties with GMC BEFORE the draft to be able to afford not just Williams (check out how much Vea makes), but also to be able to do the OTHER things that’d result from using our #5 pick on a DLineman (like sign top-quality FA OLinemen instead of drafting them with our #5). The other consideration for BA & Licht is that Bucs NEED a LOT of quality players to FIX our offense AND defense, but have limited salary CAP room to acquire quality FAs. Meaning? Trading down out of #5 to acquire an EXTRA 1st or 2nd Round pick makes a ton of sense this year (that obviously assumes that we DON’T DRAFT another RoJo or Aguayo, but rather draft someone who can actually HELP US as a starter or key rotational player). Swchifty Buc–no doubt dude! everyone of those guys needs cutting, hoping we can get a draft pik for McCoy, love to get Trent Brown for O-Line and get Iupati also. Then we could focus on defense. draft q.williams…if he’s gone, trade down draft ed oliver R1…..zach allen R2…. I think McCoy would look great in an Eagles uniform. doesnt matter who you cut if Licht is pulling the strings. This guy is a complete moron. I cant believe he still has a job, fir him before its too late. The likely trade down will be with the Giants or Jaguars….and if we are really fortunate, then again with the Broncos or Redskins. This could be a golden opportunity to receive multiple draft picks. Do it! Trade McCoy for the eagles’ 3nd and 5th round pick this year. As a matter of fact BUC IT! Start a bidding war for the rights to get McCoy. Teams like the eagle,browns,raiders,Texans would all want him. Sell him to the highest bidder. And now he writes this article…. With Vinny being cut, just enforces free agentcy rule #1…. never sign a guy off the super bowl winner that is very good. They just tend to get over paid and won’t produce the same way they did on a great team, plus they are content. Well we’ll find out a lot about McCoy if he takes less in the hopes of actually seeing the post season, or if he just chases dollars. Also the eagles fans will eat him alive if he’s as bad there as he was here last season. I’d try to trade McCoy for LB Jordan Hicks. Trade McCoy for Trent Brown straight up. McCoy wins a Super Bowl and we get a previous 7th rounder. Why can’t we just develop players man. Have I missed something? Is Unrein still on the team. If he is not for long. He’s went into concussion protocol for the umpteenth time in 2018 and missed the season. He’s not coming back…at least I hope he doesn’t because he is a prime candidate for CTE. He needs to retire. But retire or the Bucs cut him..Spotrac has him listed at almost 4 million…3,750,000. This is just another reason I’m not worried about the cap so much. 4.8 million from Dotson….love him but he’s grown too expensive for an aging player who is clearly breaking down physically. That’s 45 million of cap space without much pain or effect on our talent. I feel badly about Dot…he’s a warrior but he’s 33 and has trouble staying healthy. wake up delusional ones…. i’ll type slow and bold for you…. MCCOY HAS ZERO TRADE VALUE OUTSIDE OF JON GURDEN…… SIMPLE AS THAT….. NO NFL GM IS GOING TO CANCER93 13 MILLION TO DESTROY THEIR LOCKER ROOM AND QUIT ON THEIR COACHES…. a year to late for that!!!!!! There was “real” value that the bucs could have trade and already had the process started!!!!!!! But no, The sheep and local media was to scheme around and build around a certain player, and the owners are trying to jam him into the stupid ring of honor!!!!!!!!!!!!!!!!! And they wonder why failure is the regular around the franchise!!!!!!!!!!!!!!! 2019 season will reveal answers to the sheep, that the “real” fans already know!!!!!!!!!!!!!!!!!!!!! Somewhere on south beach sits three men under a cabana sipping adult beverages and enjoying the day. Mike Smith, Chris Baker and JR Sweezy. MS: “Oh yes, Dirk is an OC for life, we knew being the HC was over his head. offense. Look out New Orleans. JS: “Ha-ha, good one Coach”. The Eagles don’t want anyone from this Tampa Bay Bucs team. Trust me. If you want to cut McCoy, you don’t know football. if you want to keep McCoy you support basement titles and career losers. SCOREBOARD PROVES IT! E. Smith is both a backup Center and backup Guard. Who do you have to step up if Jensen goes down. Keep E. Smith! Trade or cut D. Smith! Yes tmax McCoy is the reason this team always loses, it couldnt be the coaches or the questionable personnel decisions it is just mccoy. Not to say I even like him but man you are a troll. Hey Joe I rarely comment but have been reading articles since the beginning. Tmax is a stain on your comment section. Maybe the Devon White pick isn’t so crazy with a short trade back to say 7?